I-35 to Yarrington RD: Large bluebonnet field and mealy blue sage and cactus corner of Yarrington RD and I-35 service road. FM 2001 to Rogers Ranch RD: The large field is still there along FM 2001 and still looks fairly good. 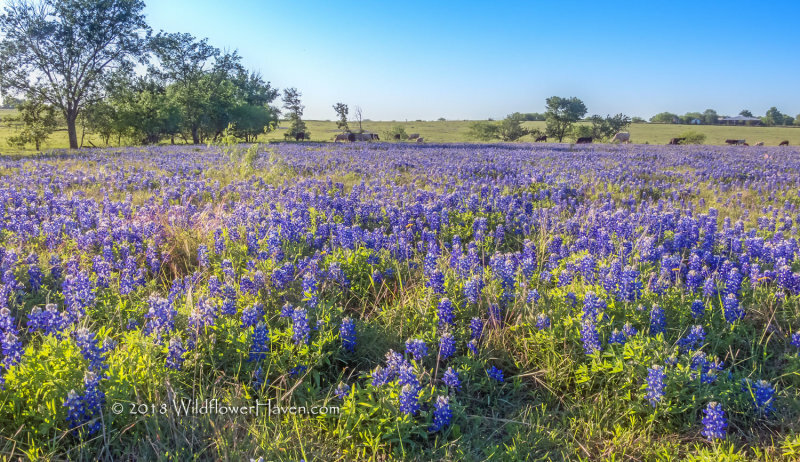 Schuelke RD/Rolling Ridge/Polonia RD to FM 2001: Field with large stretches of bluebonnets along Schuelke RD. Based on a tip from Debbie B., I ventured back out to Rogers Ranch RD which runs off FM 2001. The last time I scouted that area, I was rushed for time and did not do my usual thorough job of checking all roads in the area. I went straight where Rogers Ranch RD turned to the right. Had I made that right turn, I would have come across one very huge field of bluebonnets right at the corner of Rogers Ranch RD and Schuelke RD. Further down Schuelke RD is another large field of bluebonnets, but this one is broken up into long wide stretches and large patches – like the one field along FM 2001. This field and the Rogers Ranch RD field would have been good locations for a sunrise shot. I was also on a mission to find some mealy blue sage. A friend had told me about a large field along FM 150 just west of Kyle. It took two passes to locate the field, as it is a bit higher up than the road at that point. The angle of the sun did not provide a good shot of that field, besides when I pulled over the grass was taller than the tops of my car windows! But no worries, I found some mealy blue sage and cactus right at the corner of Yarrington RD and the I-35 service RD. The cactus is not in the best of shape, but I was able to eek out a couple images at that location. I did notice in my images, that the healthy cactus plants are just getting ready to bloom. On the northeast corner of Yarrington RD and I-35 is really large field of bluebonnets, but I decided not to photograph it as it was mostly just a large flat field. I did not see much of anything else except that the pink evening primrose still looked good along FM 2001. 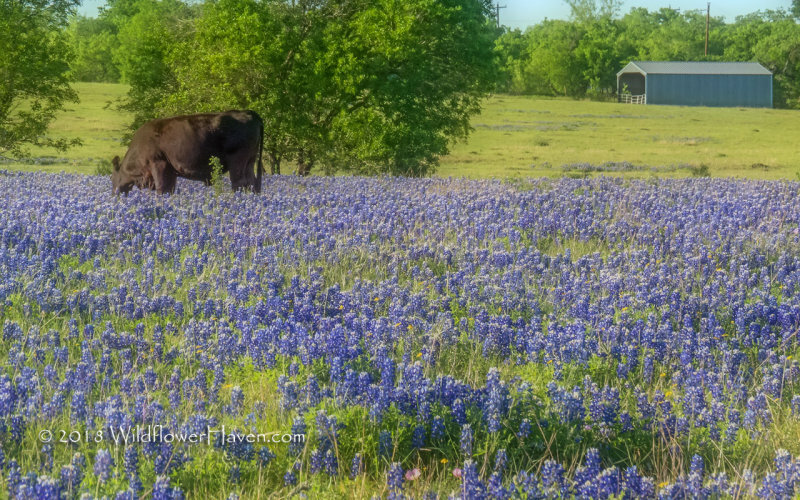 I did not have time to revisit the mixed primrose and bluebonnet field along FM 1101 NE of New Braunfels. Rogers Ranch RD to Schuelke RD: The bluebonnets in the field on Rogers Ranch RD still looked really good. Seedpods were not noticed by me and although most blooms had white tops, there were still many with white tops and even a few new buds. It looks like the field might have had some trampling by the cows at night especially near the corner of Rogers Ranch and Schuelke RD. There is a barn in the distance that can be captured in an image. There is room to safely pull over. This is fenced private property! You must get permission from the property owner to enter the field. Do NOT trespass! You can safely and easily take photos from the side of the road, both along Rogers Ranch RD and along Schuelke RD. I stopped and took a number of photos around 6:00 pm, but decided to take a short break to do some more scouting until the sun was lower in the sky. Yarrington RD at I-35: After shooting the Rogers Ranch RD, I made my way back to the I-35 service road at Yarrington RD to photograph the mealy blue sage. I got there just before sunset. The field faces mostly west, so the mealy blue sage was bathed in setting sunlight. I actually had to color adjust my images just to get the mealy blue sage back closer to blue – they still came out with a purple tint. There is plenty of mealy blue sage mixed in with the cactus along with what I think is greenthread (Thelesperma filifolium). Lot of the cactus plants look like they are suffering from some kind of bug infestation, so they were not that photogenic. Still it was nice to find this surprise right along the service road. There are plenty of spots were you can safely pull off the service road – no curbing there yet. It was a welcome surprise to see the large field along Rogers Ranch Rd. That was the highlight of my trip. The field is large enough to give you that bluebonnet fragrance. During my scouting break, I drove several other roads, but still saw very little else in that general area compared to the FM 2001 and Rogers Ranch Rd. I kept hoping to find a field or even a roadside covered with mealy blue sage and mixed wildflowers. The best I came across was that one field along the I-35 service RD. Next Trips: Waiting to see what pops up for May wildflowers. I will be posting a new update with notes on where the May wildflowers might make a good showing. 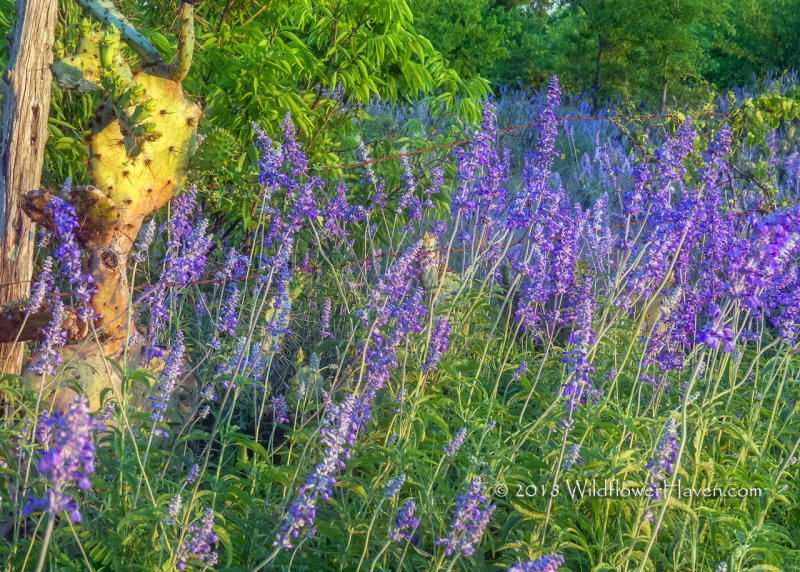 Check here in the Texas Wildflower Reports 2018 section, in our seasonal updates section (http://www.wildflowerhaven.com/Commun...4/scope/threads) and on our Texas Wildflower Report Facebook Page (https://www.facebook.com/TexasWildflowerReport/) for the latest reports.